Background and objectives CKD is characterized by remarkably high hospitalization and readmission rates. Our study aim was to test a medication therapy management intervention to reduce subsequent acute care utilization. Design, setting, participants, & measurements The CKD Medication Intervention Trial was a single-blind (investigators), randomized clinical trial conducted at Providence Health Care in Spokane, Washington. Patients with CKD stages 3–5 not treated by dialysis who were hospitalized for acute illness were recruited. The intervention was designed to improve posthospitalization care by medication therapy management. A pharmacist delivered the intervention as a single home visit within 7 days of discharge. The intervention included these fundamental elements: comprehensive medication review, medication action plan, and a personal medication list. The primary outcome was a composite of acute care utilization (hospital readmissions and emergency department and urgent care visits) for 90 days after hospitalization. Results Baseline characteristics of participants (n=141) included the following: age, 69±11 (mean±SD) years old; women, 48% (67 of 141); diabetes, 56% (79 of 141); hypertension, 83% (117 of 141); eGFR, 41±14 ml/min per 1.73 m2 (serum creatinine–based Chronic Kidney Disease Epidemiology Collaboration equation); and urine albumin-to-creatinine ratio median, 43 mg/g (interquartile range, 8–528) creatinine. The most common primary diagnoses for hospitalization were the following: cardiovascular events, 36% (51 of 141); infections, 18% (26 of 141); and kidney diseases, 12% (17 of 141). The primary outcome occurred in 32 of 72 (44%) of the medication intervention group and 28 of 69 (41%) of those in usual care (log rank P=0.72). For only hospital readmission, the rate was 19 of 72 (26%) in the medication intervention group and 18 of 69 (26%) in the usual care group (log rank P=0.95). There was no between-group difference in achievement of guideline-based goals for use of renin-angiotensin system inhibition or for BP, hemoglobin, phosphorus, or parathyroid hormone. Conclusions Acute care utilization after hospitalization was not reduced by a pharmacist-led medication therapy management intervention at the transition from hospital to home. CKD is characterized by remarkably high hospitalization rates. Compared with Medicare beneficiaries without CKD, those with CKD stages 3–5 not treated by dialysis (ND) have hospitalization rates that are tripled to quintupled (200 versus 600–1000 admissions per 1000 patient-years, respectively), with some of Medicare’s highest reported 30-day readmission and death rates (28%–31%) in the years 2012–2014 (1). Rates of all readmissions and readmissions with death increase progressively with CKD severity (2). The overall risk of readmission was almost 80% higher, and risk of fatal readmission was increased by 2.5-fold at CKD stage 5 ND compared with that in hospitalized patients without CKD in a large Washington state database (2). Hospitalizations also contribute to exorbitant expenses. In the year 2013, Medicare patients with CKD consumed $50 billion, nearly 20% of all expenditures (1). Despite enormous human and societal costs, CKD ND has not been a condition of focus for systematized efforts to reduce readmissions or improve posthospitalization care. Adverse drug events account for two thirds of all adverse events and increase readmission risk after hospitalization (3–6). Patients with CKD typically have complex medication regimens and an extraordinary burden of comorbidity. In a recent study of hospitalized patients, high medication complexity on admission more than doubled the risk of readmission for an adverse drug event (7). Moreover, acute illness compounds risk of adverse drug events in CKD (8,9). Strategies to improve medication management during the hospital to home transition may reduce adverse drug events and readmissions (10–15). The aim of this study was to determine the effect of a medication therapy management intervention on acute care utilization after hospitalization in patients with CKD ND. Adult patients with CKD stages 3–5 ND hospitalized for acute illness were recruited for the CKD Medication Intervention Trial (CKD-MIT; ClinicalTrials.gov, NCT01459770). CKD was defined by the clinical laboratory–reported eGFR (Modification of Diet in Renal Disease [MDRD] formula) <60 ml/min per 1.73 m2 with at least two measurements of serum creatinine concentration 3 or more months apart during the year before the index hospital admission (16). A consecutive sample was identified by daily screening of patients admitted to acute care units of Providence Health Care (Sacred Heart Medical Center and Holy Family Hospital) in Spokane, Washington. Participants were enrolled between February 2012 and February 2015, with the last follow-up in May 2015. The main clinical exclusion criteria included planned hospital admission or ESRD. Patients were also excluded for discharge to an extended care facility, discharge to a rehabilitation center, or discharge with home medication services. The study was reviewed and approved by the Providence Institutional Review Board and adhered to the principles of the Declaration of Helsinki. All participants gave written informed consent to join the study. The CKD-MIT was a single-blind (investigators), randomized, controlled clinical trial (17). Research coordinators randomized enrollees in a 1:1 ratio to the medication intervention or the usual care discharge process by a computer-generated random allocation sequence stratified by diabetes status. Assignment was concealed until the study pharmacist was notified of the participant’s randomization group. In the usual care group, participants received an electronic health record–derived medication list and discharge prescriptions presented by a nurse at the time of hospital discharge. They also received clinical education from the nursing staff using teach back to verify understanding of “red flag” signs and symptoms, necessity of filling new prescriptions right away, importance of clinical follow-up, and delivering the discharge medication list to their health care providers. This work practice was established across hospital units during conduct of the study. Participants in the CKD-MIT medication intervention group received the usual hospital discharge process in addition to the intervention. After their baseline visit, they subsequently received a 1- to 2-hour in-home visit from a study pharmacist for the intervention within 7 days of hospital discharge. The intervention included the following fundamental elements of medication therapy management as defined by a collaborative of pharmacy professional organizations: comprehensive medication review, medication action plan, and a personal medication list (18). It was designed to improve patient medication management, self-efficacy, and adherence as well as increase engagement and information transfer between participants and their health care providers. The intervention was augmented by the Chronic Care Model and on the basis of an algorithm for the “5As” (Assessment, Advice, Agreement, Assistance, and Arrangements) process with specific intervention elements (Supplemental Table 1) (19,20). The Medication Discrepancy Tool, designed for reconciliation of medication regimens across settings and prescribers, was used to identify and resolve medication problems at both the patient level (adverse drug reactions or side effects, drug intolerance, unfilled prescription, financial barriers, nonadherence, and performance deficits) and the system level (prescribed despite allergy or intolerance; discordant instructions; confusion between brand and generic drug names; unclear discharge instructions; duplicated prescriptions; incorrect dose, quantity, or label; unrecognized impairments in cognition or dexterity; and lack of caregiver) (20). In addition to a personalized medication list, participants in the intervention group were advised about proper medicine use and avoidance of contraindicated drugs. Study pharmacists (J.J.N., B.J.G., and S.M.S.) were specifically trained for the CKD-MIT. They evaluated drug doses for kidney function, and when discrepancies or other potential medication-related problems were found, the pharmacists triaged the type and severity of the issue for follow-up. In some cases, the action plan involved the patient or caregiver discussing solutions with the prescriber to encourage patient involvement in medication self-management. In other situations, the pharmacist directly informed health care providers about actionable medication problems, such as need for dose adjustments or participant medication-taking practices. Pharmacists contacted the primary care physicians or nephrologists, depending on the prescription, but they did not provide specific disease management. Providers were reached by telephone or email, with verification of contact. Awareness of CKD by study participants and their hospital-based health care providers was ascertained at enrollment. Participants were asked if they had ever been told that they had kidney disease, low kidney function, or any problems with their kidneys. Provider awareness was determined by a diagnosis of kidney disease on the problem list or diagnostic codes on the electronic health record (16). Participants in both groups had three study assessments after hospital discharge: (1) baseline within 7 days, (2) 30 days, and (3) 90 days. A research coordinator conducted assessments composed of interval acute care utilization, admissions to extended care facilities or rehabilitation centers, adverse events, and review and update of the medication list. Measurements included vital signs and laboratory testing (serum electrolytes, creatinine, phosphorus, parathyroid hormone, glucose, hemoglobin A1c [HbA1c], complete blood count, and urine albumin-to-creatinine ratio [UACR]). The primary outcome for the CKD-MIT was a composite of acute care utilization events (hospitalization or emergency department and urgent care center visits) for 90 days after hospital discharge. This timeframe was chosen to examine a longer timeframe than the usual 30-day outcome defined by health care payer parameters. For each hospitalization, visit to an emergency department or urgent care center, and adverse event, diagnoses were adjudicated by physician investigators (K.R.T. and R.Z.A.) on the basis of a prespecified classification system (17). Secondary outcomes were individual events comprising the primary outcome and achievement of goals for guideline-based CKD care. Use rates of angiotensin-converting enzyme (ACE) inhibitors or angiotensin receptor blockers (ARBs) and goals for BP, HbA1c (diabetic participants), Hb, phosphorus, and parathyroid hormone were defined by clinical practice guidelines current at the time that the CKD-MIT was conducted (21–26). Serious adverse events and adverse events were ascertained at study assessments and by electronic health record review. Hospitalizations were counted as serious adverse events and study outcomes. The sample size was projected from a pilot study (approximately 50% reduction in 30-day readmissions) in a general population of hospitalized patients (n=232) (27). On the basis of a large observed effect of this intervention compared with usual care in a CKD ND subset (one of 16 or 6% versus seven of 17 or 41% first events, respectively), a conservative projection was made for a power estimate for the CKD-MIT medication therapy management intervention (14% versus 40% rate for the first primary outcome event). Power was estimated at 82%, with an α of 0.05 and 120 study participants completing 90 days of follow-up. For improved accuracy and precision compared with standard clinical laboratory reporting (MDRD equation), the study eGFR was calculated using serum creatinine and the Chronic Kidney Disease Epidemiology Collaboration equation (28). Means±SD were calculated for normally distributed variables. For skewed variables, data were log transformed for analyses and back transformed to median and interquartile range (IQR) for reporting. Dichotomous variables were reported as n/N and percentage. Time to event analyses were conducted with Kaplan–Meier plots and the log rank test to determine the effect of the intervention on primary and secondary outcomes. Generalized estimating equations were used to assess group by time interactions for CKD-related measures. Diagnostic classifications were assessed using Fisher exact test. Because study participation was defined by occurrence of a study-related activity, which began at the baseline visit, intention to treat analyses were applied to data from those who attended the baseline visit (n=141). Assessment for data completeness was performed for primary and secondary outcomes. Statistical significance was set at a two-sided P value <0.05. Data analyses and computations were conducted using SPSS, version 23 (IBM Corporation). Of 770 patients screened for the CKD-MIT, 182 were consented, 159 were randomized, 141 entered study participation (defined by attending the baseline visit), and 120 completed the 90-day follow-up visit [Consolidated Standards of Reporting Trials (CONSORT) diagram] (Figure 1). Baseline characteristics of study participants (n=141) (Tables 1 and 2) included the following: 69±11 years of age (mean±SD), 48% (67 of 141) women, 86% (121 of 141) white/European race, 83% (117 of 141) with a history of hypertension, and 56% (79 of 141) with diabetes. Baseline eGFR was 41±14 ml/min per 1.73 m2, and 61% (86 of 141) had CKD stages 3b–5 ND. The median UACR was 43 (IQR, 8–528) mg/g. The three most frequent categories of primary diagnoses for the index hospitalization were as follows: cardiovascular events, 36% (51 of 141); infections, 18% (26 of 141); and kidney diseases, 12% (17 of 141). The primary admission diagnoses for kidney diseases included AKI in 76% (13 of 17), volume depletion in 18% (three of 17), and nephrotic syndrome in 6% (one of 17). The median length of stay was 3 (IQR, 2–5) days. The number of medications at hospital discharge was 13±5. The most common medication classes included (Supplemental Table 2) the following: antihypertensive agents other than renin-angiotensin system inhibitors, 70% (98 of 141); statins, 61% (86 of 141); diuretics, 60% (85 of 141); aspirin, 57% (80 of 141); vitamin D supplements, 51% (72 of 141); psychotropic agents, 49% (69 of 141); and ACE inhibitors and ARBs, 46% (65 of 141). At baseline, the prevalence of hypertension by history was 75% (54 of 72) in the intervention group and 91% (65 of 69) in the usual care group. Baseline systolic and diastolic BP levels were similar between them at 132±23 and 131±20 mm Hg, respectively, and 72±10 and 73±12 mm Hg, respectively. The majority of CKD-MIT participants and hospital-based health care providers, 77% (96 of 124) and 79% (112 of 141), respectively, were aware of the diagnosis of kidney disease. For chronic care, 77% (109 of 141) of participants had primary care providers, and 13% (18 of 141) had nephrologists. A provider for chronic care was not identified for 10% (14 of 141). All study participants spoke English. Consolidated Standards of Reporting Trials (CONSORT) diagram. Study participant flow in the CKD Medication Intervention Trial. Participants in the intervention group were visited by a study pharmacist at a median of 6 (IQR, 5–7) days after hospital discharge. Medication problems, including discrepancies and others, were identified in 92% (66 of 72) (Table 3). The median number of medication problems per participant was three (IQR, 2–5). In total, 263 medication problems were recorded, with 71% (190 of 263) resolved at the visit. The primary outcome, a composite of first acute care events (hospitalization and emergency department and urgent care center visits) within the 90-day period after index hospitalization, occurred in 43% (60 of 141) of CKD-MIT participants, with 44% (32 of 72) in the medication intervention group and 41% (28 of 69) in the usual care group (log rank P=0.72) (Figure 2). When evaluated as a secondary outcome of only hospitalization, the event rate was 26% (19 of 72) in the medication intervention group and 26% (18 of 69) in the usual care group (log rank P=0.95) (Figure 3A). The combination of emergency department and urgent care center visits occurred in 24% (17 of 72) of the medication intervention group and 19% (13 of 69) of the usual care group (log rank P=0.49) (Figure 3B). The three most frequent categories of primary diagnoses for readmission were as follows: cardiovascular events, 30% (11 of 37); gastrointestinal diseases, 30% (11 of 37); and infections, 24% (nine of 37). The most frequent categories of primary diagnoses for emergency department and urgent care center visits were as follows: infections, 27% (eight of 30); gastrointestinal diseases, 17% (five of 30); and cardiovascular events, 17% (five of 30). No data for acute care utilization events were missing. 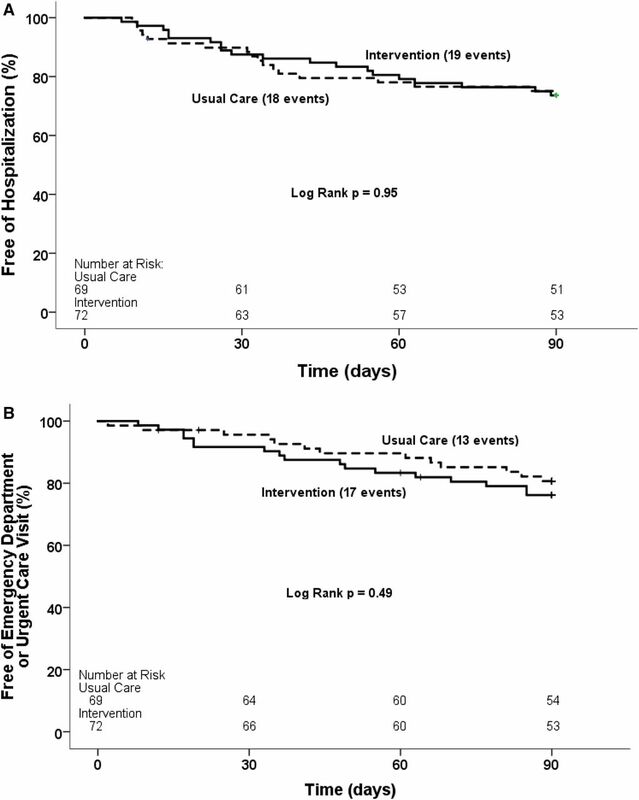 Survival free of the primary outcome, a composite of first acute care events, did not differ between the intervention group and the usual care group within the 90-day period after index hospitalization. Kaplan-Meier survival curves for time to first hospitalization, emergency department visit, or urgent care center visit. Solid lines are for the intervention group; dashed lines are for the usual care group. 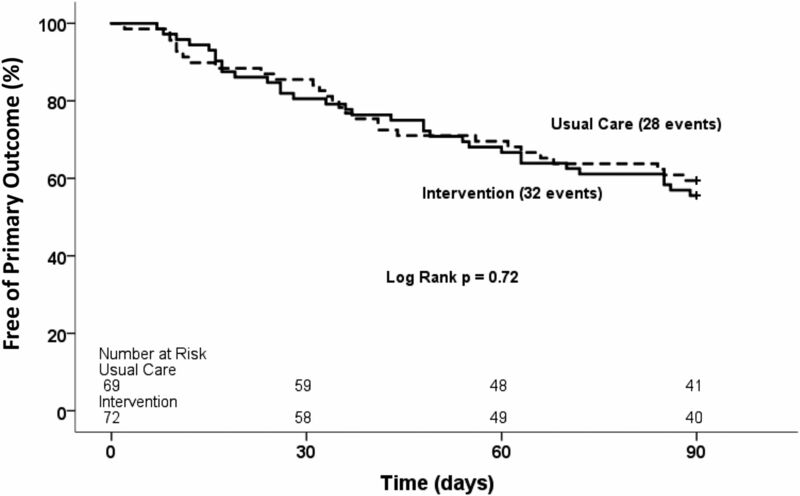 Survival free of the secondary outcomes did not differ between the intervention group and the usual care group within the 90-day period after index hospitalization. Kaplan-Meier survival curves for time to first: (A) Hospitalization; (B) Emergency department or urgent care visit. Solid lines are for the intervention group; dashed lines are for the usual care group. eGFR, serum creatinine, and UACR did not differ between groups or over time (Table 2). Similarly, none of the guideline-based targets for CKD care differed. ACE inhibitor and ARB usage did not change, and irrespective of a BP target set at either <140/90 or <130/80 mm Hg, neither proportion at goal nor means differed. Hb, serum phosphorus and parathyroid hormone, and HbA1c (diabetic participants) were similar between groups regardless of whether analyzed as the proportion at goal or mean/median values. For these data, completeness rates were >95% except for UACR and parathyroid hormone, with approximately 80% data completeness for each. Serious adverse events, including five deaths, occurred in 38% (53 of 141) of study participants (Supplemental Table 3). Adverse events occurred in 25% (35 of 141) of participants. In parallel with acute care utilization, cardiovascular, gastrointestinal, and infectious complications predominated as the most frequent categories of serious adverse events and adverse events after hospitalization. Rates of these events did not differ significantly between groups and were not considered study related. The CKD-MIT study participants had moderate to severe CKD ND with hospital admission for acute illness, most commonly cardiovascular events, infections, and kidney diseases. An intervention for medication therapy management designed to improve care during the transition from hospital to home did not reduce their high rate of acute care utilization: 43% within 90 days. The intervention did not change rates of either hospital readmission or visits to emergency departments and urgent care centers. CKD risk factors, complications, and achievement of guideline-based goals were also unchanged. Patients with CKD ND have complications after hospitalization that are related to underlying kidney diseases as well as other acute and chronic conditions (1,2). Adverse drug events occur commonly and have been targeted as a modifiable risk for posthospitalization complications (10–15). Pharmacist-provided medication services after discharge improve continuity of care by identifying and reconciling medication problems, providing patient education, and facilitating medication information transfer (2). Similar improvement in processes of care was accomplished in the CKD-MIT by the medication therapy management intervention. Notably, 92% of participants assigned to the intervention group had discrepancies or other medication-related problems, with a median of three each. The study intervention resolved 72% of the total number, but this process improvement did not translate into lower rates of acute care utilization or better guideline-based care. The CKD-MIT pharmacists conducted a single home visit designed to educate and engage participants along with their caregivers to resolve medication discrepancies. However, the resolution status of some could not be determined and others were not resolvable at a single visit. For example, counseling and education were provided to nonadherent participants, but whether they became adherent subsequently could not be determined. In a prior study of a general population of hospitalized patients with homecare nurse interventionists, medication discrepancies required multiple visits for resolution (12,27). Medication management services conducted within quality improvement projects sponsored by the Center for Medicare Services have reported reductions in hospitalization rates of 15%–35%, but they required long-term (up to 6 years) follow-up to detect improvements (28–30). These quality projects featured multifaceted transitional care along with longitudinal care coordination with at least quarterly contact between patients and a variety of health care professionals. Whether similarly intensive interactions would produce better long-term outcomes after hospitalization for patients with CKD is unknown. The CKD-MIT included mostly older adults with moderate to severe CKD ND and a high burden of comorbidity (17). In comparably ill patients, such as those with heart failure or advanced age, multiple attempts have been made to improve the hospital discharge process, including health coaching, pharmacy-based drug management, electronic surveillance tools, structured telephone support, outpatient clinic–based and educational interventions, and home visiting programs (31–36). In contrast to studies conducted in the general population, none reduced occurrence of short-term hospital readmissions (11,15). 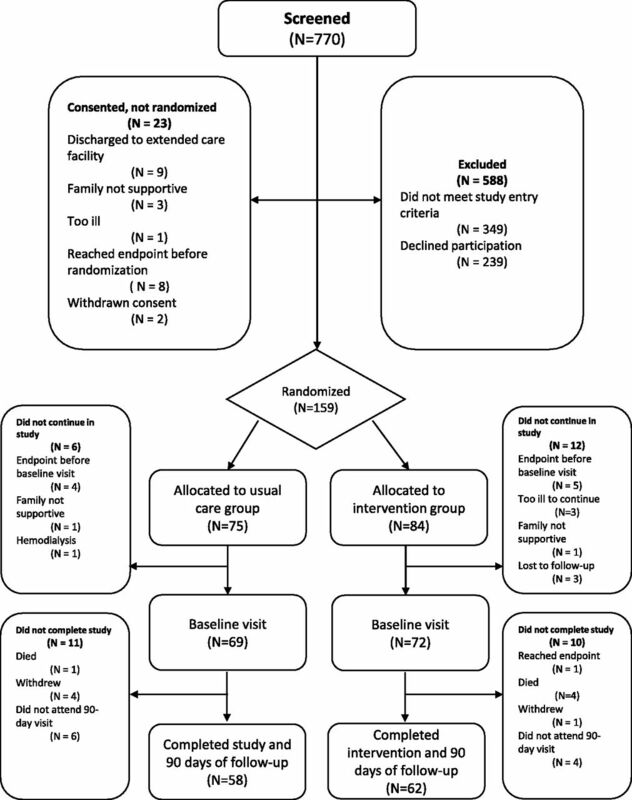 Furthermore, a study of telephone-based medication assessment and reconciliation delivered by pharmacists between 3 and 7 days after hospital discharge showed that readmission rates were lower after 7–14 days but were not lower after 30 days, suggesting that benefits of medication intervention posthospitalization are brief (37). In fact, in a clinical trial among seniors (>80 years of age), one to two pharmacist home visits for medication review after hospital discharge actually increased readmissions by 30% over 6 months compared with the control group receiving usual care (33). Other longitudinal programs with home visits and multidisciplinary clinics for chronic conditions, such as heart failure, have been reported to provide modest reductions in hospital admission rates (34–36). Acute illness superimposed on chronic conditions produces complications driven by complexities that likely require multipronged approaches to prevent repeated need for acute care services. Various clinical practice guidelines recommend targets and management strategies for CKD (21–26). Implementation of a widely recognized recommendation, BP control with an ACE inhibitor or an ARB, did not differ between the intervention and usual care groups. Renin-angiotensin system inhibitors were used in less than one half of the CKD-MIT participants at discharge, which may reflect discontinuation of these drugs during severe illness or AKI due to concerns about adverse drug events and other complications, such as hyperkalemia (38,39). Indeed, three quarters of the CKD-MIT participants with a primary diagnosis of kidney disease for hospital admission had AKI. Nevertheless, use of renin-angiotensin system inhibitors did not increase after hospitalization, although kidney function was stable overall. Depending on whether the systolic BP goal was set at <140 or <130 mm Hg, both randomized groups had similar control rates at approximately 70% and 50%, respectively. Rates of diastolic BP at target were higher, but this finding may reflect arterial stiffness among older adults with CKD (40). In both the intervention and usual care groups, measures of anemia and bone and mineral metabolism disorders were normal or only mildly abnormal. Similarly, among the CKD-MIT participants with diabetes, the mean HbA1c was approximately 7% in both groups and stable throughout the study. Most diabetic participants, approximately 70%, had an HbA1c<7.5%, in keeping with guideline-based goals current at the time that the CKD-MIT was conducted (23,24). Patients with CKD ND who are sick enough to be hospitalized have comorbidity indices exceeding those of most other chronic conditions (2,17). Enrollment and participation in clinical trials by acutely ill patients are challenging. Among the CKD-MIT participants, the numbers and types of hospitalizations and adverse events reflect their high complexity and severity of illness (17). Moreover, of 182 consented, 41 were lost before participation, mostly because of reasons such as reaching a study end point, initiation of dialysis, or placement in an extended care facility within the first week after discharge before a baseline visit could be conducted. Nevertheless, a strength was achievement of the goal of 120 participants completing the study. Other strengths included adjudicated diagnoses and a complete dataset for the primary outcome. CKD awareness was high in the CKD-MIT participants compared with other ambulatory or hospitalized populations (41–44). Because interest in study participation was likely greater in kidney disease–aware patients, selection bias is a limitation. The study intervention was also limited by a single visit at the transition from hospital to home, with an aim to reduce acute care utilization. The study did not provide ongoing medication management or assess chronic care. The CKD-MIT was also a single-site study of mostly white/European, English-speaking patients in the northwestern United States. On the basis of existing knowledge guiding the research hypothesis, the CKD-MIT was sufficiently powered. The primary outcome rate in the usual care group was almost exactly as predicted, and no sign of benefit from the intervention was detected. However, studies of more diverse patients and settings might produce different results. 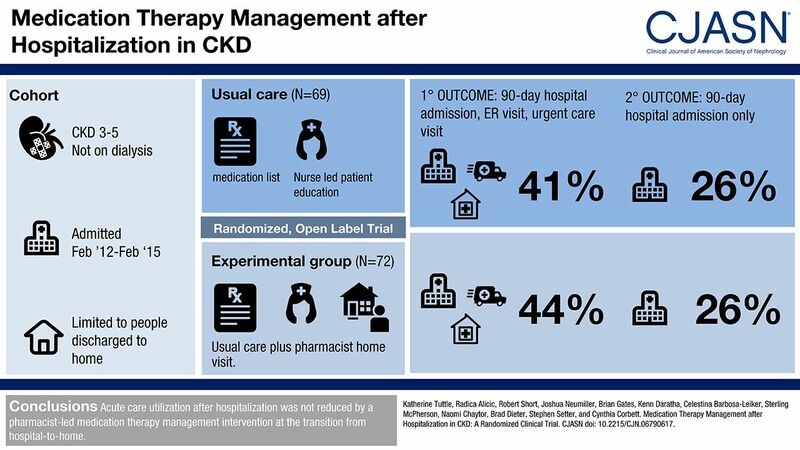 In conclusion, a pharmacist-led intervention to improve medication therapy management at the hospital to home transition did not reduce high rates of hospital readmission or visits to emergency departments and urgent care centers in acutely ill patients with CKD ND. The intervention also did not improve guideline-based CKD care. More comprehensive medication management strategies, including longitudinal coordinated care, should be studied to reduce future hospitalizations of these high-risk patients. K.R.T. has received consulting fees from Eli Lilly and Company, Boehringer Ingelheim, Gilead, and Astra Zeneca. J.J.N. has received consulting fees from Eli Lilly and Company, Sanofi, Novo Nordisk, and Boehringer Ingelheim. C.B.-L. and S.M.M. have received research funding from the Bristol–Myers Squibb Foundation. C.F.C. has received research funding from Pfizer Inc. R.Z.A., R.A.S., B.J.G., K.B.D., N.S.C., B.P.D., and S.M.S. (deceased) have (or had) no relationships to disclose. The authors thank the CKD Medication Intervention Trial (CKD-MIT) participants for their commitment to the study. We also acknowledge the Data Safety and Monitoring Board members and the Providence Institutional Review Board members, who provided expert oversight and guidance over the course of the CKD-MIT. The dedication of the research coordinators and staff to expertly conduct study activities is genuinely appreciated as well. National Institute of Diabetes and Digestive and Kidney Diseases grant R34DK094016 provided funding support for the CKD-MIT. The sponsor had no role in design and conduct of the study; collection, management, analysis, and interpretation of the data; preparation, review, or approval of the manuscript; and decision to submit the manuscript for publication. See related editorial, “Why Nomenclature for Pharmacist-Led Interventions Matters: Conquering the State of Confusion,” on pages 198–200. This article contains supplemental material online at http://cjasn.asnjournals.org/lookup/suppl/doi:10.2215/CJN.06790617/-/DCSupplemental.